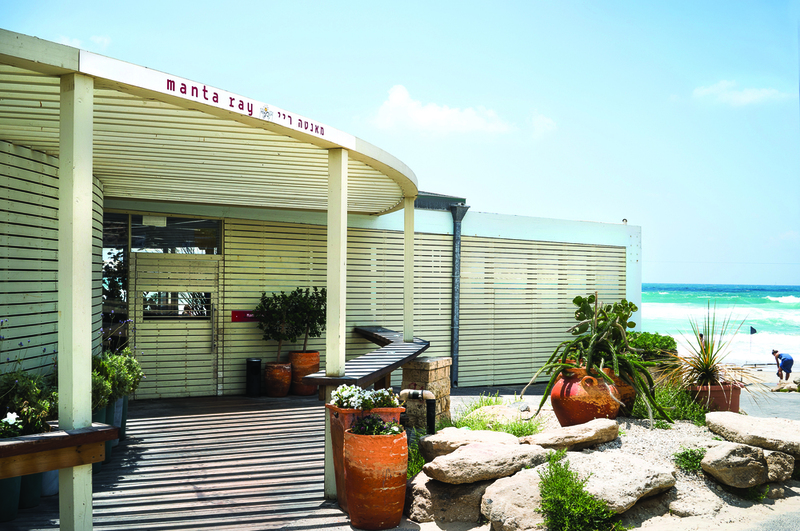 Tel Aviv is a city of high design and blistering sun. Galit Gaon is combatting one with the other. Galit Goan has a sunny disposition. She speaks softly when describing her love of Tel Aviv, her voice rich in timbre. During her college years, the Israeli city is where she called home. She is the chief curator of Design Museum Holo, which, should anyone ask, is in Tel Aviv. "It's recognized as a Tel Aviv museum," Gaon says. Hollow is technically four miles south, but that's walking distance for younger legs. The Ron Arad-designed museum is currently celebrating its fifth year with a series of special exhibitions; among them is one of great sociological heft for Goan, "Urban Shade in Israel," on view through Oct. 31. "Urban Shade," the culmination of independent research conducted over 3 three years, is part of a national effort to bring awareness to an infrastructural dilemma: the city's low percentage of shaded public areas. "When you go around in Tel Aviv, it's not dry," she says. "The humidity is annoying. There's no place to hide. Because it's a crowded city, it's an island of heat." She inveighs against the sun ever-so-cooly before introducing the idea of covered walkways and gazebos. "When you live in the Middle East," she says, "you understand that pergolas are more important than air conditioning." The exhibit is one of many that Goan has curated since assuming her post. It fits perfectly with her mission statement about design, which she believes can have an impact on visitors to the museum. She knows her métier well, but there's only so much a curator can do. "A museum isn't about changing the visitors into designers," she says. "It's to teach them about design to show them they live in a design world." The museum buildings itself, a modern icon with its Cor-Ten steel spirals enveloping box-shaped concrete galleries, is a good introduction for visitors. "It looks like something you recognize but down know what it is," Goad says. "You actually breath differently upon entering the building." The Jerusalem-born Gaon is a part of a dynasty; her father was the first design curator at the Israel Museum. He exposed her to his work at a very young age, in and out of the house. The family dinner table was a destination for designers like Ettore Sottsass and Issey Miyake. Goan remembers fondly listening in as they quarreled and exchanged ideas. It isn't an wonder that Gaon chose the path she was born into. She was 5 years old when her father began putting her to work. "I was raised in the museum," she recalls. "I was working beside him, and it continued until he passed away 17 years ago." Gaon moved to Tel Aviv from Jerusalem after time in the Israeli army. She remembers the city wasn't very evolved, but that it was a place that fostered creativity. "It was just open for ideas. Jerusalem is very traditional, and if you wanted to do something new, you had to go to Tel Aviv." Her adult career started in Tel Aviv. It was her home for many years until she became a mother. "Having 25 exhibitions every year, it's impossible to take care of my kids all the time," she says in a rueful tone. Today Gaon lives with her family in a suburb of the city. She says that because of her hectic schedule, it's where she needs to be for now, hopefully in the shade. "The moment they graduate from high school," she says, "I'm gong back to Tel Aviv."